OG-EVKIN Decanter can shorten the scanting process time, as well as keeping the smooth and aromatic scent fo wine , enhancing the original value, bringing out the bouqet without waiting. Enjoy. Just place the order here and enjoy better wine taste experience! SAY GOODBYE TO WINE STAINS TABLE: No more wine stains drop on your table or cloth. The wine will go just directly from the wine bottle to your cup. Within seconds, you'll get a perfect glass of wine, every time you want! 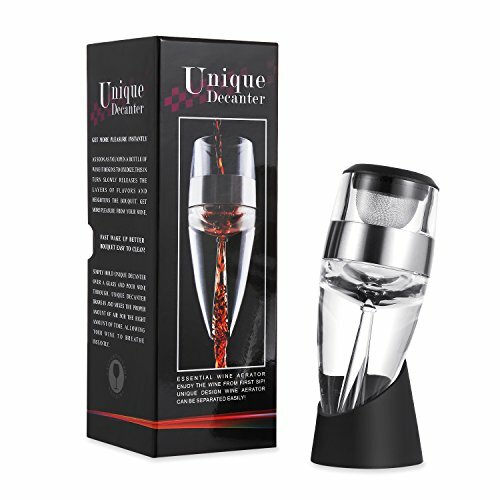 ELEGANT WINE AERATOR TOP FILTER: A filter is used with our aerator decanter to remove wine sediments when you pour. Aerate your wine to perfection instantly. HOW DO WE WORK TO BE DECANTER: Simple hold the wine decanter over a glass and pour wine through. The aerator draws in and mixes the proper amount of air for the right amount of wine. Allowing your wine to breathe instantly. 100% MONEY BACK IF NOT SATISFIED. If you have any questions about this product by OG-EVKIN, contact us by completing and submitting the form below. If you are looking for a specif part number, please include it with your message.